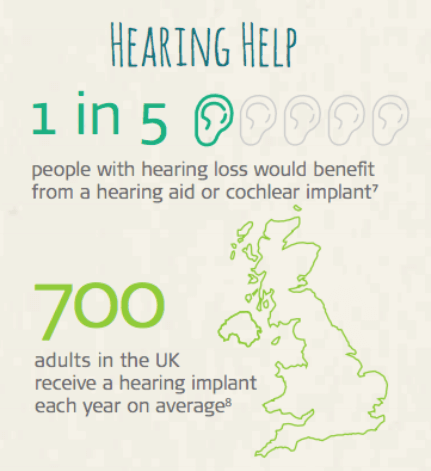 More than 10 million people in the UK suffer from hearing loss or deafness – that is almost the whole population of London and Manchester together. Also, there are 45,000 deaf children in the UK, which makes hearing loss a topic for young and old. Since the causes of hearing loss can be diverse, there is also a huge variety of hearing loss treatments available today. However, one alarming fact is that at least 4 million people who don’t have hearing support would actually benefit from using them. In face of today’s access to advanced assistive technologies, anxiety or fear still are keeping hearing loss patients from getting the auditory aid they need. Apart from that, not getting treated can result in even more health issues. Tinnitus is another big issue when it comes to ear problems. In 2017, tinnitus is affecting more people than in 2016: 600 million people worldwide. However, personalities like Bill Clinton, Halle Berry or Beethoven have proven that the impact of hearing loss on our life can be controlled by us – with the right kind of hearing loss treatment. Depending on the cause of the impaired hearing sense, its treatments will vary enormously. The right choice is unfortunately not only about features and design, but calls for a customized solution based on the type of hearing loss. There are four types of hearing loss that determine on how to tackle indvidual hearing loss. When it comes to conductive hearing loss, ear infections, excessive earwax, a foreign object trapped inside the ear canal, a hole in the eardrum or a problem preventing the three ossicles from vibrating cause a blockage in the outer or middle ear and may be the root of hearing loss. In this case, sound waves no longer reach the sensory hair cells in the inner ear. While this hearing loss type can be temporary or permanent, it usually is experienced as a mild or moderate hearing impairment. It can be remedied with medication, hearing aids or other solutions such as hearing implants. A sensorineural hearing loss stems from a problem with the hair cells in the inner ear. They are either damaged or missing. Depending on where in the cochlea these hair cells are damaged or even absent, the hearing loss occurs in the higher or the lower frequencies. The more hair cells are missing, the more serious the hearing loss will be. People with sensorineural hearing loss usually require a more permanent solution for their hearing loss. This can either be a hearing aid, in cases of mild to moderate-severe hearing loss, or a hearing implant for a serious or even profound hearing loss. Mixed hearing loss as a combination of sensorineural and conductive hearing loss can also be treated through medication, sensory surgery, hearing aids or hearing implants depending on the root cause. Neural hearing loss is a rare, but profound and permanent type of hearing loss. It is caused by an absent or damaged auditory nerve and the sound information cannot be passed on to the brain. This requires an auditory brainstem implant involving brain surgery. While there are non-technical solutions aiming to make life with hearing loss easier and better, such as lip reading, sign language and innovative approaches from pioneering artists like Christine Sun Kim, the main solutions, of course, are technical ones: hearing aids and implants. A hearing aid is a device that amplifies sound thanks to a built-in microphone. It picks it up and processes it into an electrical signal, using a tiny computer. The hearing aid can be customized to suit the level of hearing loss. Digital hearing aids are becoming more and more convenient as they even adjust to noisy or quiet environments. Hearing aids are the best solution for many hard of hearing people and should be explored as the first option. NHS also follows the trend of digital hearing aids. Many hearing aids work through air conduction, when sound travels down our ear canal and middle ear to the cochlea in your inner ear. However, there might be unexpected hurdles to tackle. If medical conditions make NHS hearing support a challenge, then there are alternatives which bypass our ear canal and send sound vibrations straight to our inner ear. Which hearing loss treatment for which hearing loss? Due to the vast variety of hearing aids at hand, we should seek professional advice, also from the NHS, before making this important decision. There are behind-the-ear digital aids, all-in-one digital aids and many more. The huge range of hearing aid products allows us to choose an ideal, individual hearing loss solution. CROS hearing aids for example are ideal for hearing loss in one ear only while BiCROS hearing aids are designed for a different level of hearing loss on each side. Hence, hearing aids are about details such as visibility, pricing, maintenance and user-friendliness. More about hearing aids. Implantable solutions are to be considered when hearing aids do not bring the expected benefits. Thanks to today’s advanced technology, implantable hearing loss solutions can be life-changing in a previously unimaginable way. Cochlear implants as a hearing loss treatment can electronically replace the human hearing sense. The non-functioning part of the inner ear is bypassed by the cochlear implant and its function is taken over by it. This way, people suffering from severe to profound sensorineural hearing loss can experience the sense of hearing again. People with severe high-frequency hearing loss who hear reasonably well in the low frequencies can benefit from a combination of cochlear implant technology and a hearing aid: Electric Acoustic Stimulation. A bone conduction implant was designed for people with single-sided deafness and for anyone who cannot use hearing aids for medical reasons. A bone conduction implant conducts sound via the bone straight to the inner ear. A middle ear implant is another alternative for people who cannot use hearing aids for medical reasons, e.g. who have a malformed outer or middle ear.